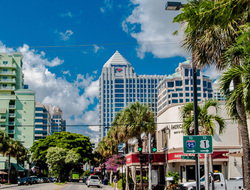 Las Olas blvd is a collection of some of the most unique architecturally appealing storefronts engulfed with excellent fine and casual dining options. Stroll along the blvd and sampling some of the finest art venues and boutique shops offering the finest in fashion trends. The Galleria Mall offers some the finest shopping in Broward county with a variety of nightlife and dining options. Trueluck's offers an incredible wine selection to match the culinary treasures that are available year round. Blue Martini often an excellent option for a business lunch hosts several events throughout the week from fashion to world renown DJ's and bands. Several of our clients at Vacation Rental Gizmo often remarked at the convenience from casual shopping to happy hour at Trueluck's and Blue Martini. This area offers something for everyone! I throughly enjoyed my brief by successful trip to this venue. This mall is located just across the street from my dentist and I was able to visit after my appointment. I visted the Sephora and received excellent service. The food court is beautiful. The mall is filled with almost the same shoppes you see at other malls (which are many) in the Plantation/Ft Lauderdale area, but the location of this mall, near the beach and 'downtown Ft. Lauderdale' was a nice change from the city-ish lifestyle of downtown Miami. Next time I'm staying for a bit longer than lunch time. Boasting the largest exclusive Outlet mall in the USA, the largest outlet and value retail shopping destination in the United States. With more than 350 stores, including outlet locations from Nike, Tommy Hilfiger, Ralph Lauren and Gap, plus value retailers OFF 5th Saks Fifth Avenue, Bed Bath & Beyond, Target, Marshalls and electronics superstore, BrandsMart USA, Sawgrass Mills has everything from fashion and jewelry to electronics, sporting equipment, beauty products, home accessories, toys and more. There is something for everyone in this enclosed, air conditioned and climate controlled mall. Shopping at Sawgrass Mills can’t be beat with over 40 exclusive outlets not found anywhere else in South Florida including Burberry Factory Outlet, David Yurman, Prada, Salvatore Ferragamo Company Store and Tory Burch. Fashionistas will delight in luxury-brand shopping at The Colonnade Outlets at Sawgrass Mills.